Here’s something rather interesting, and unexpected from a bunch of local lads. Reka Studios is a small Malaysian outfit dabbling in the field of artificial intelligence (AI), and the company is currently in the early stages of developing smart solutions for factories – think driverless forklifts. Established in 2014, Reka Studios is made up of 20 individuals from different backgrounds – there are some from computer science, electronic engineering, biomedics and even the aerospace industry. The company has two facilities; a headquarters in KL and an R&D lab in Melaka. Interestingly for us, Reka has since September 2016 started developing its own self-driving or autonomous car tech. The fruits of their work has so far undergone a series of tests and real-life demonstrations at events and exhibitions. To learn more about this, we had a chat with Reka Studios CEO Muhammad Haziq Faris Hasnol, asking him about the company’s beginnings, vision and the challenges it faces. Haziq, 27, explained that it all started from an electronic chip they produced, known as the Reka Innovation Gear (RIG). “As with most of the driverless cars in existence today, the system that we’re developing is in Category 3 of autonomous driving levels,” he told Paultan.org BM. In this level, the car is able to drive itself, with a human to watch over proceedings and intervene if necessary. Level 4 is fully autonomous within the operational design domain of the car. So far Reka has come up with three prototype cars with its autonomous system. The earliest car – a Proton Waja – started testing in November 2016. 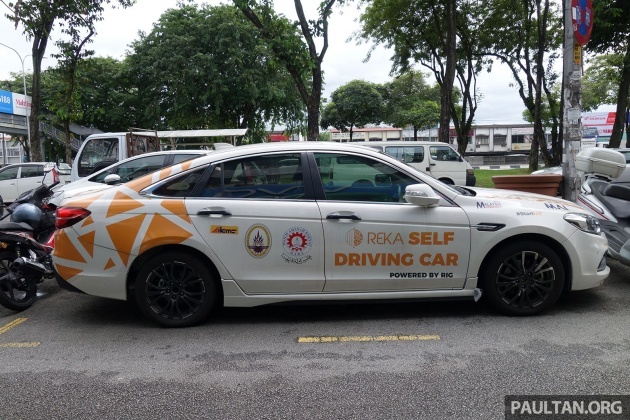 Around a month after that, they tested the self-driving car from KL to Melaka with two passengers in the rear seats and no driver. So far, the system’s optimum operational range is between 60 to 80 km/h. For turning at junctions, it works at speeds between 20 to 30 km/h, and braking distances are from five to 10 metres. The operating range is as tested so far, based on Google Maps navigation. Currently, Reka has moved on to two units of the Proton Perdana loaned to them by Majlis Amanah Rakyat (MARA) dan Nano Malaysia. These two sedans, which feature a more stable system and neater integration, are frequently brought out for public demos. “In terms of hardware, we use existing off-the-shelf technology such as cameras (they started off with a dashcam), radar sensors and laser, among other things. But what’s vital is our self-developed smart software,” Haziq said, adding that they have dreams of commercialising the product in the next few years. To who though, that’s the question. “Based on feedback from manufacturers and government agencies that we have met, they’re not showing the interest as hoped in the potential of this homegrown tech,” Haziq concedes. Reka Studios has been seeking tie-ups to polish and improve its product’s capabilities, and also for help to patent it. Haziq says that the firm has received offers from foreign firms interested in co-operation and to further the development of the technology, among them companies from Singapore and Australia. However, they are a little reluctant to go down that path, as the Singaporean firm, for instance, requires that they move down south and be based in the city state. There’s also the issue of patent ownership. “We’re not rejecting the offers from foreign parties, but in the coming year or two we will try to survive and find a way to contribute our energy and skills to our own country. If that doesn’t work out, then we will consider the offers from foreign parties,” he explained. Hearing about Reka’s considerable efforts with limited resources, and vision, makes us even more curious on the background of the young CEO. Haziq studied computer science at the University of Cambridge, but he did not complete his course. Not because he couldn’t cope, but because he accepted an offer by Google to work in the US. “I then returned to Malaysia with the dream to contribute my energy and creativity to my own country. So, for a year or two before I set up Reka Studios, I went around Malaysia – based on tips – to find and meet with individuals with different skills, but the same dream,” Haziq shared. The nationwide hunt yielded some interesting colleagues for Haziq. “Among us is a local aerospace engineer who had a learning stint at NASA in the US, and also a guy who helped develop face detection software on Samsung cameras,” he shared, adding that the varied backgrounds of his team members is an advantage for Reka. The patriotic and inventive spirit shown by Haziq and Reka Studios is commendable, and we wish them all the best in their journey of developing autonomous car technology. Syabas Reka Studios! R&D… not Rilek&Duduk. All the best, Reka Studios! Proton 1.8Bil R&D will surely develop alot more. All the best P1!! Wow…this is unexpected. I personally support these young lads efforts. Myb they can make it open source so that more malaysians can contribute since it is very competetive sector by the giants. This is the typical example of why locals move abroad, a talented lot they are yet they get doors shut on their faces, so why does the gov bother with setting up TalentCorp, MIDA, Pemandu etc etc when right before their eyes they have talents like this? Pls elaborate further how “they get doors shut on their faces”. That doesnt imply doors shutting in their faces cuz of gov like u saying above. It just means their product havent reach maturity level that can be commercialised. Just see above what they have now. Do u really want that exposed gigantic PCB board and dangling wires on ur newly bought car? But i will concede that certain gov agencies (ie MAI) can & shud help them commercialise their product; if it has reach that level, but its just not yet there. You mean the government must wait for their tech to reach maturity before willing to fund them?? They are doing r n d, of cause you gonna have wires dangling around in the car. How wud u sell an immature product then? Wud u buy an ipongX with screen not securely fixed and wires jutting out? If want to follow gov sapot route, they need to “sell” to gov b4 selling to markets. U r putting the chicken b4 the egg. Entrepreneurship isnt like that. U NEED to have a polished pre-production product b4 convincing anybody to sapot/invest/buy. Prime example is see Kickstarter projeks. The ones that get most sapot r those that can present something thats close to the final product. Is Reka any diff than other innovators? They deserve the sapot, yes i agree. But they need show the achievement levels to unlock the sapot. Very proud to see local boys doing awesome stuff like this. It has been such a long time we made international news for the right reasons! Myb they can make upload videos of the whole journey )with dummy driver just in case the authority wants to intervene). Make better publicity and im sure they can go further. In that case, the word “range” is unnecessary and confusing. “system’s optimum operating speed is between 60 to 80 km/h” is much less ambiguous no? and how do you measure range by km/H???? Err. Thats why im askin the writer? Is he talkin about range or max speed. “from 60 to 80 km/h” or “60km/h < Operation speed < 80km/h"
is a range… or u need a special class for you learn what is a "range"
Maths has nothing to do with comprehension, dude. And pls enlighten me how to measure range using km/h, cuz what i learnt from MATH skool, km/h indicates speed not distance. he is not mentioning the speed as range, you are confusing range to another terminology we who went to school learned: DISTANCE! range here refers to a statement such as: stoop between a baboon and john! It range of speed lol. 60 km/h or 80km/h itself it speed. When 60-80km/h, we call it range between 60 to 80 km/h..
A range means a figure from A to B. Yeah author was correct to say the speed ranged 60-80 km/hour. What’s wrong with you fellas picking on this super tiny stuff. 60km/h to 80km/h is a range of speed.. ..not just range or speed but range of speed.. so if the road is straight line as in long stretch highway.. the car’s speed will be around 60km/h to 80km/h hence it cannot go slower than 60km/h and cannot go faster than 80km/h. And for the cornering.. the speed it takes cornering will be around 20km/h to 30km/h depending on the some factors that weren’t mentioned in the article. Hope my 2.6cent of explanation can clear something. Appreciate ur 2.6 cents. And yes, while range can infer 60km/h to 80km/h, what was written “optimum operational range” sounds more like distance, no? So instead of confusing pipu, why not make the sentence clearer like what I wrote @7.37pm above? Range here means the variatian of value (speed) between two limits (lower & upper speed limit). Range can be distance, speed, temperature, weight ( or any other parameter) range.. most people wont get confused especially when the measurement is clearly stated and understanding the context… range is not a replacement word for distance. the statement is clear enough.. The outcome is what u see on the roads, unless u stay in hutan. Just an advice but somebody shud tell him that the system is still very experimental & proof-of-concept for local automakers to take up their offer. I suggest they get an SME grant from gov to come out with a prototype complete product (SoC co-processor module, tighter integration of camera & radar modules to the car, no wires dangling here & there, etc). There is a market for this, but they need to get it commercialise-ready b4 any takers can consider. Its under development stage. It is dangle with wires here and there. Aiya. Then why do Reka expects all these automakers to buy a developmental stage product? Aiya. so fast foreign country realized his talent…our local agency still sleeping is it? As mentioned above, they working with local agencies: Majlis Amanah Rakyat (MARA) dan Nano Malaysia. Another thing about autonomous tech. Its not the hardware which is difficult (can be off-the-shelf as proven by Reka), but its the software which needs to be smart enuff & fast enuff to crunch data from all those sensors it “sees”. Kudos to Reka for reaching this far on their own! OMG, not interested? common government, this is a Malaysia’s Gem, grap it before foreigner do. As usual, local companies, be it private corporation or GLCs are not interested to support local made innovations. They instead prefer to go outside the country to look for the innovation at a higher cost. You cannot always depends on government to support them. Come on Proton, hire these guys… Proton should be hiring these guys before selling stakes to Geely. Need to wake up now before it’s too late. For now I believe their focus on serving factory logistics is good. It’s a relatively controlled environment for them to make a reliable product, build their reputation, gain market experience, and gain some revenues. All the while continuing R&D for driverless road vehicles. Proton can inject some money in, open up a “heavy industry” wing for that purpose. But, they barely have enough money to make ordinary cars let alone help develop autonomous tech. WOW. this upstarts(Reka) started testing in December 2016 with NO driver & have 2 passengers in the rear seats from KL to Melaka. That is a Testament worthy to be praised. Bravo Reka. is that a scn5 actuator for the brake? hahahaha. i thought control brake and throttle boleh terus ke ecu? anyway this is how malays do it. scarce resources makes u think creatively. all the best guys. you guys should find someone that can find fund, market and sell the idea. capitalize all the fund eventho redundant.pivot to realistic application that lead to cashflow. i use tensor flow for the camera. now getting easier for the ai. Okla…now in the spirit of TN50, lets hope REKA STUDIOS get more help and support. Heck all of them should be awarded some conference title for their awesome contribution with limited resources, once this goes live fully. They should try out on smaller area first. Certainly a very good potential eg autonomous golf course buggies. Conference transport eg KLCC size. Theme parks transport. Ekceli, areas with chaotic pedestrians moving about is much much more difficult for autonomous systems to operate. It can confuse all the sensors and the co-processor will overload calculating all that movement going about. An open road with traffic going 1 way is easier to test out than the scenario above. Try going to China , there you will get attention and lots of venture capital. Here most want your tech proven overseas first. This is mainly due to our own citizen having poor misconceptions about Made in MY things/ideas. Pipu here alwiz think Buatan Impot/Oang Puteh/Jepunis is superior despite the contrary facts sometimes. Very true.. when proven oversea then you put it in your company resume.. better of european countries or japan.. This is AMAZING! I wish you all the best in your future undertakings and hope to one day see you guys as a Malaysian success story! You inspire innovation and you guys are awesome! The priority here should be to automate trucks when they are on highways. This saves lives. If the cost per truck is several thousand MYR, it should be attractive to transport companies. Because the driver salary for the bulk of the journey can be cut (the driver does not really have to do anything, just sit and observe). Get the MPs to quickly pass a law to allow it. Launch an online petition to force the MPs to do so. Is there any malaysia bilionair to invest money to develop their own eletric car & provide wide charging station facilities . wow. these guys are not play-play. well done!! !